The small size of the set, measuring 5 7/8 inches in height. There is no damage to the canister or lid. 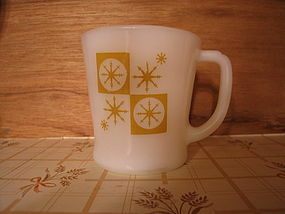 Other sizes are available, as well as the matching utensil holder. I need your zip code to calculate the postage. Without the lid, the height is 5 7/8 inches. The canister and lid are without damage. Other sizes are available. I need your zip code to calculate the postage. Canister with lid measuring 7 1/4 in height and 6 7/8 inches in width. There is no damage. Other sizes available. I need your zip code to calculate the postage. This is the flour canister (7 1/4 x 6 7/8 inches - measurement does not include lid) size. There is no damage to canister or lid. 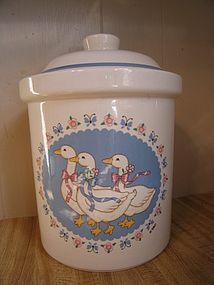 All other sizes of the canister set are available, as well as matching utensil holder. I need your zip code to calculate the postage. 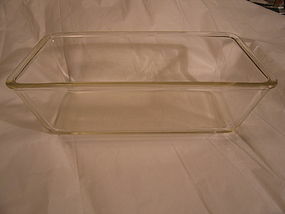 Vintage loaf pan marked as 214 A-CC. The size is the uncommon two quart. It is not made for microwave use. Light roughness on the interior rim in a couple of places. I have 2 of this size available. I need your zip code to calculate the postage. No chips, cracks, breaks or rough rims. The finish has no loss. 3 are available. I need your zip code to calculate the postage. 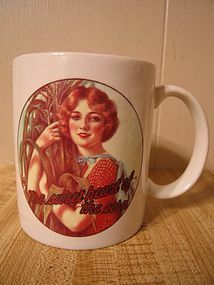 Sweetheart of the Corn cup from 1996. It is 3 3/4 inches in height. There is little, if any sign of use. 3 are available and priced individually. I need your zip code to calculate the postage. 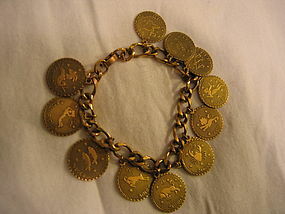 Vintage bracelet with a charm for each astrological sign. The chain and charms appear to be brass. It measures slightly over 7 1/4 inches in length. There is no damage. Additional photos by email. I need your zip code to calculate the postage. 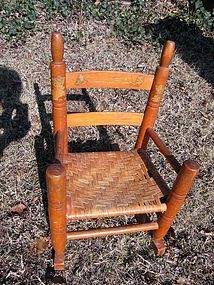 Vintage child size caned rocker with ladder back. There is one area of damage of the caning, which can be seen in the photo. The chair is in a tight sturdy condition. The underside of the seat is in an undamaged condition. There are some some small drops of paint on the wooden areas. I will provide complete condition photos by email. I need your zip code to calculate the postage. 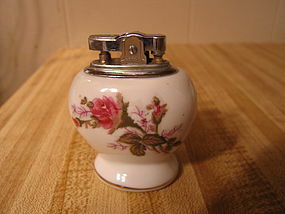 Vintage porcelain Table lighter manufactured in Japan. I believe it is part of the Ucagco pattern. Does not appear to have been used and the flint sparks. It has no damage, but has stray paint from manufacturer. Matching cigarette box is available. I need your zip code to calculate the postage. 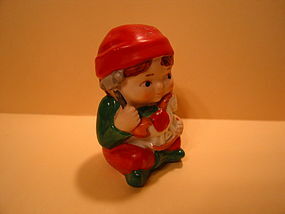 Manufactured in 1983. Still has the original powder in the shaker. No damage. Girl figure is available . I need your zip code to calculate the postage. 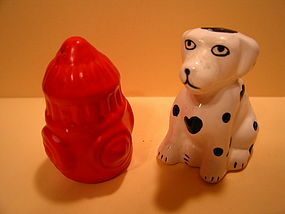 Salt and pepper set with no damage, other than a tiny dot of paint loss to the hydrant. I need your zip code to calculate the postage. 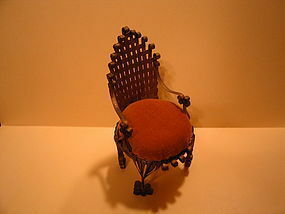 Vintage chair pincushion. Minor wear to the finish. The cloth seat is gold colored. I need your zip code to calculate the postage. 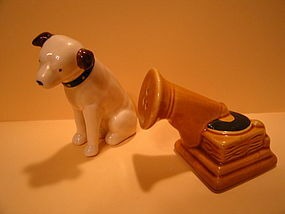 GE Nipper and gramophone salt and pepper shakers. There is no damage to either piece. I need your zip code to calculate the postage. Amber salt and pepper shakers. There is no damage. I need your zip code to calculate the postage. 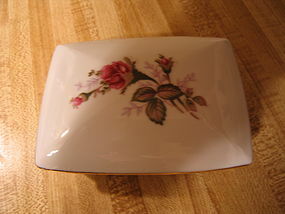 Vintage covered box measuring 4 3/4 x 3 5/8 x 2 inches. I believe this box was manufactured by Ucagco. There is a blue Japan sticker on the bottom. The matching table lighter is available. No damage, but has manufacturing flaws. This is the bread or dessert size of 6 3/8 inches in width. There is little, if any sign of use. 4 are available. I need your zip to calculate the postage. 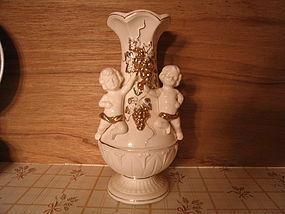 Vintage ceramic vase with cherubs, grapes and vines. It was manufactured in Japan. The height is approximately 8 1/2 inches. There are no chips, cracks, breaks, rough rims or repairs. Light wear to the gold. The body of the vase is crazed, but it does not appear to be age crazing, but more from the manufacturing process and could have been intentional. I need your zip code to calculate the postage.